What if there was a store that had everything you could think of? Now, imagine deals for each item that are so amazing they almost don’t seem real. Introducing Wish. A mobile app that puts millions of items at your fingertips — at prices so low they’ll shock you. At Wish, we remove the overhead and mark-ups of other stores, allowing you to shop for items direct from the factory delivered from around the world. Explore millions of products with millions of consumer reviews you can trust. If you can wait 5-15 days for delivery, you’ll get lower prices than any other retailer. From fashion, to makeup, to home goods, to tech & gadgets— you’ll be the envy of all your friends. Ready to experience factory-direct shopping on your mobile phone? We are thrilled to welcome Wish as a new partner of the Los Angeles Lakers. When it came to the jersey patch, knowing its prominent placement, our goal was to partner with an innovative and ambitious global company. Wish more than checks that box. They are a leader in e-commerce and are constantly striving to grow and improve their brand and how they connect with their consumers. In addition, and most importantly, we are excited to partner with a company that shares our commitment to giving back to the community." 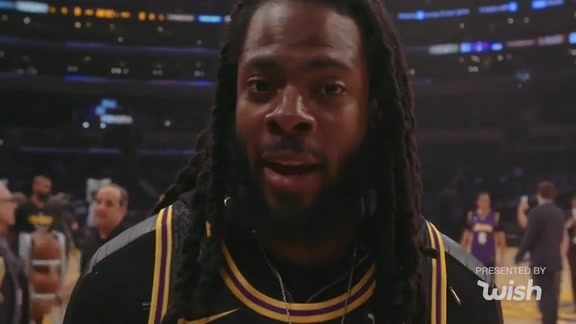 LA native Richard Sherman has been rooting for the purple & gold since ’88 so Wish wanted to make sure he could cheer his team on the right way. He was in the building to see Andre Ingram’s Lakers debut! Check out Richard’s evening. 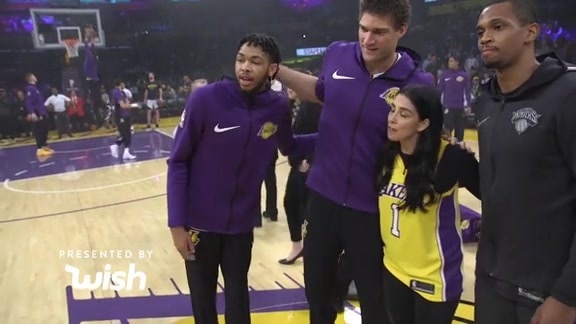 March 11th was an unforgettable evening for a handful of Wish stars who were invited to enjoy a Lakers game from a private suite. Wish wanted to say thank you to some of their most loyal users who consistently share high quality photos, videos and reviews on the Wish App. 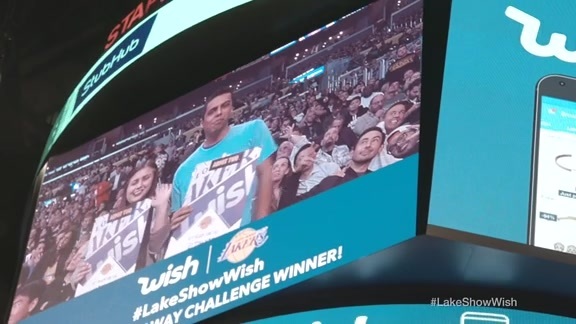 Drinks were passed, friendships were made, Lakers fans went wild… and the Wish community was alive. 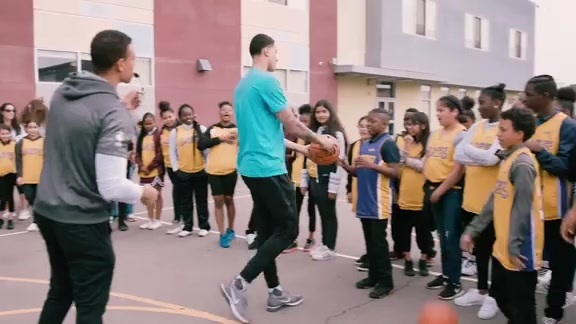 The kids of Alliance Leadership Middle Academy needed new basketball jerseys so Wish made it happen and of course such important items shouldn’t just be shipped, they should be delivered and that’s exactly what Kyle Kuzma did...deliver. We didn’t have an average Game Ball Deliverer at the Lakers vs Cavs game on March 11th. 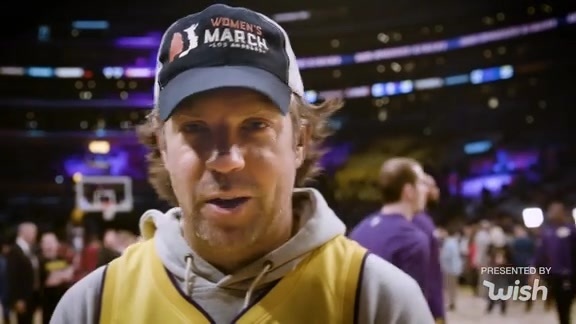 Jason Sudeikis was invited to deliver on behalf of Wish and he didn’t disappoint. Wish thanked Sarah Silverman for making the internet a kinder place with courtside seats after she responded to an internet troll by paying for his medical treatment. Jordan Clarkson, Lonzo Ball, and Kyle Kuzma did some christmas shopping on the Wish App for those who otherwise wouldn't have gotten to open any presents. Oscar Flores won a Lakers and Wish Instagram contest by showing his game face. Lakers get ready to start the 2017-18 at Media Day in the new UCLA Health Training Facility. We are incredibly pleased to partner with the NBA’s most iconic brand. The Lakers epitomize a legacy of excellence and worldwide success. This partnership symbolizes our shared focus to reach all fans, not only within the LA community, but across every continent." EL SEGUNDO – The Los Angeles Lakers today announced a multi-year partnership with Wish, a California based, e-commerce platform. As part of the partnership, Wish’s logo will be featured on Lakers jerseys beginning in the 2017-18 season. The partnership, which brings together two global brands, will include a large-scale integrated marketing program, including in- arena fan engagement, social and digital activation. In addition, the two companies will collaborate on various community initiatives within Los Angeles and in the surrounding counties. "We are incredibly pleased to partner with the NBA’s most iconic brand," said Peter Szulczewski, CEO of Wish. "The Lakers epitomize a legacy of excellence and worldwide success. This partnership symbolizes our shared focus to reach all fans, not only within the LA community, but across every continent." "We are thrilled to welcome Wish as a new partner of the Los Angeles Lakers," said Tim Harris, President of Business Operations and Chief Operating Officer. "When it came to the jersey patch, knowing its prominent placement, our goal was to partner with an innovative and ambitious global company. Wish more than checks that box. They are a leader in e-commerce and are constantly striving to grow and improve their brand and how they connect with their consumers. In addition, and most importantly, we are excited to partner with a company that shares our commitment to giving back to the community." Wish’s logo will be on a patch stitched into the Lakers jersey on the front left shoulder opposite the Nike logo. The team will wear the jersey for the first time during the Lakers first preseason game vs. the Minnesota Timberwolves on September 30th at the Honda Center in Anaheim. The Wish patch will also be featured on the South Bay Lakers jersey, the Lakers' NBA G League minor league team, as well as on select jerseys for the Junior Lakers. 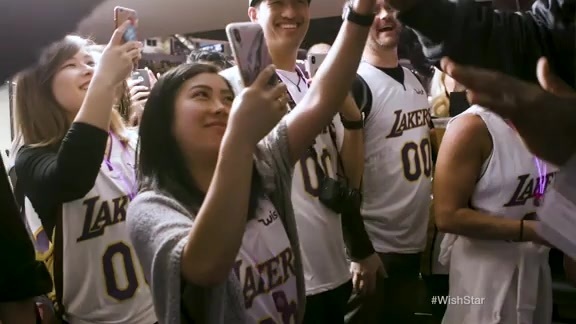 The Lakers partnered with WME | IMG’s Global Partnerships group on the jersey patch opportunity.